The day before my 30th birthday just so happened to be the day before I was to become engaged. I just didn’t know it. Hang with me here…. I’ll get to the Shiny Object Syndrome….. I knew the day was special and I thought I ought to buy a brand new dress to celebrate. I knew what I wanted – a cobalt blue silk sheath with long flowy sleeves with slits up the side of them. It was my dress equivalent of really nice pajamas and I figured that nothing makes me feel more luxurious that silk and pajamas. I also had a rad pair of hot pink pumps I intended to wear and wanted the dress to compliment but not be too matchy matchy, ya know? So I went from store to store to store looking for THE DRESS. I knew it had to exist and was even willing to compromise a bit on a detail or two after a couple of hours of shopping. I wandered into my favorite store, Nordstrom, and went right to the dress section. I like to shop alone but at this point in the day I was ready to call it when I bemoaningly described THE DRESS to a stylist who’s eyes lit up. “We have something that is almost exactly like that!” She rushed off and returned with my cobalt blue silk sheath with long flowy sleeves sans slit. To say I was excited would be an understatement. “That’s it!” I said and she started ringing me up. Before I knew it, I was walking out of Nordstrom with a $325 silk dress I would most likely only wear this once. My 30th birthday. Cost benefit started to weigh on me. I had been in business for myself for all of 6 months and had no justification for spending over $300 on one dress. THE DRESS officially cost more than my monthly car payment. I told myself I’d sleep on it, try it on again tomorrow, and then decide. I didn’t sleep much that night as I tried to come up with a reasonable answer to why I needed to keep THE DRESS. I just couldn’t make it click. Yes, THE DRESS made me feel good and it was exactly what I dreamed up and I spent an entire day looking for it and the stylist was so helpful and you only turn 30 once and ….. it still wasn’t right. 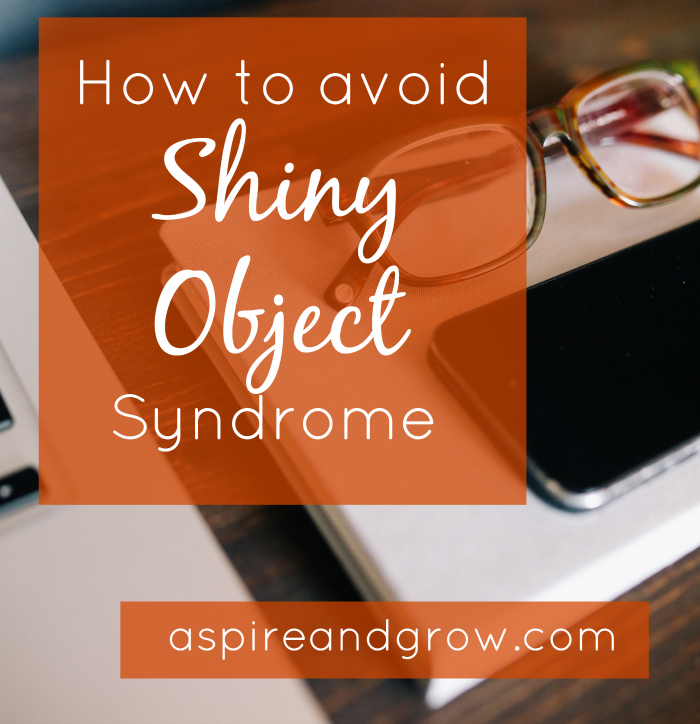 But what does this dress shopping story have to do with Shiny Object Syndrome??? Here’s the thing: shopping around for new systems and tools in your business is like buying a dress. When you find a tool or program you want to use, don’t just dive in blindly because you want it and it’s cool and someone said it was exactly what you need right now. This is the biggest lesson learned in Systems Finishing School: consider if it’s the right time to focus on that particular part of your business and act from there. So many business owners dive into big programs (with big price tags) just because they heard it’s THE PROGRAM for a successful business. Take InfusionSoft, for example. Now I love a robust program that does a lot to help you grow, but is InfusionSoft right for you? Many incredibly successful businesses run without InfusionSoft because it’s not the right fit for the systems they need. And many others find the value in the monthly cost of the program and go all in. Does it work into your budget and overall game plan? Does it do what you need it to do or are you ultimately wasting money and resources on a more robust program than your business is ready for right now? Do you need to switch up your social media game plan today or can it wait until after your launch? Do your business systems really need tweaking or is it that #FOMO creeping up? Maybe you just love what you have in place (and it’s working for you) and you can put all of those new tools into the “Well, hey, that’s nice. I’ll check it out later” file. THE DRESS was the perfect dress, but it wasn’t the perfect timing. I didn’t have the money in the bank to justify it and another more affordable and simple option was the best choice at that time. If the dress, er, system isn’t something you are ready to focus on, set it aside until you are. It’s that simple. The best way to avoid Shiny Object Syndrome is to sleep on it. Wait it out. Ask yourself if NOW is the right time. If it is, fantastic. If not, hang on until you’re ready to make that commitment. The right dress at the right time feels like a million bucks. Your systems can do the same thing with a little patience and know how….and maybe even help you make that million along the way. If you are ready to take Shiny Object Syndrome by the horns and learn exactly what you need to focus on to build a successful business in 2015, join the January class of Systems Finishing School! Applications open December 3rd and the waiting list gets first dibs. Get your spot right here!